Luc Boltanski is Professor of Sociology at the L'école des Hautes études en Sciences Sociales, Paris. Most of us take for granted the idea that the social world has a front stage made of rules and norms and a backstage of “intrigues,” “invisible plots,” and “hidden intentions.” When did that sense of a reality behind the reality of things develop? 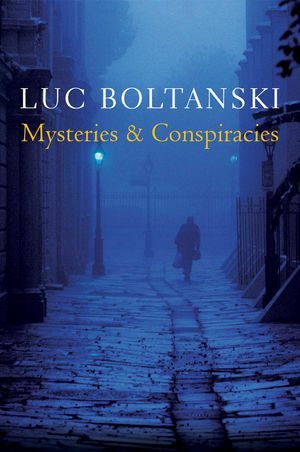 In this enigmatic book, Boltanski tracks down this new construction of a paranoid reality through a highly original reading of detective and spy novels, in which he detects the emergence of a sense that a sense that the real reality of things is concealed and malevolent. This book is both singular and provocative and resembles no other work of sociology I have read. It is a mixture of sociology of literature, of meta-sociological theory, sociology of institutions, and, perhaps mostly, sociology of modernity. It will be a needed complement to the classic The Social Construction of Reality.